So much news I’m not sure where to start!! So I’ll start with the news I completed Camp Nano last Tuesday 19th June!!! Final word count 50,997. I thoroughly enjoyed writing this story, a pirate/fantasy story currently titled ‘Red Sky’. I look forward to coming back and editing it in a month or two. 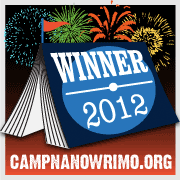 For anyone who wants to take part in Camp Nano, there is another one in August. Will I be there you ask? Well… I might. I had so much fun this month that I’m really quite looking forward to doing it again as long as I find a story to write! 🙂 My characters were such fun company, and I loved writing something a little bit different (I’ve never written about Pirates before!). My cabin mates on the Camp Nano site were great company, (Keep going girls! You can do it!!). What are your writing plans for next month? Thanks Kelly! Certainly has been a big month. Not sure about next month yet, a few short stories maybe, and some editing.